Rubin Rivera, a 68-year-old Vietnam veteran, said he was feeling dizzy last September on his way to the VA hospital when he got ticketed on the bus for not having a receipt — even though he had a bus transfer. UPPER EAST SIDE — The M15's "select bus service" — with off-bus ticketing for quicker boarding — has sped up the commute along First and Second avenues, riders and the MTA say. But some riders, particularly those visiting East Side hospitals and claim to have medical conditions affecting their ability to operate the machines, are calling for aggressive fare inspections to slow down. Riders who don't have a receipt from a fare machine risk a $100 fine. "We are hearing from people on this bus who are paying or trying to pay, but the enforcement is overly aggressive," City Councilwoman Jessica Lappin said Wednesday, issuing a report card for the bus where she gave it an A grade for speed and frequency but a D for its ticketing system and ease of use. 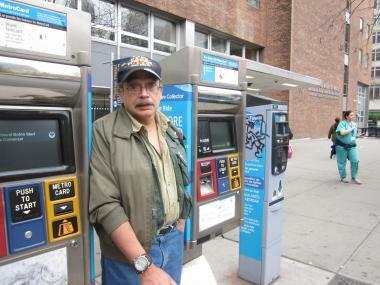 "This $2.25 fare is costing me over $110," said Rubin Rivera, a 68-year-old Vietnam veteran, who got a summons in September — which increased because he had yet to pay — when he was having a dizzy spell on his way to the VA hospital on 23rd Street and First Avenue. Rivera said he had a transfer from a crosstown bus on East 79th Street but was unable to read instructions because of his condition and didn't get a receipt from the sidewalk machine when he boarded the select bus. Francine Phillips got a $100 ticket about a year ago when she was woozy after having cataract surgery at the New York Eye & Ear Infirmary on East 14th Street and Second Avenue and claimed she couldn't find a working machine in her rush to get home. Despite the patch on her left eye, an MTA inspector who boarded at East 23rd Street escorted her off the bus and wrote her a summons. "I was wobbly and I was afraid I was going to fall," she said of her encounter with the officer forcing her off the bus. "I got very shook up." After six months of contesting the ticket, she was able to settle it. "We're not asking [inspectors] to break the law but to use their discretion when appropriate, particularly when the MTA machines are broken," Lappin said, noting that her office frequently receives complaints about broken machines. "The MTA still needs to do a better job with fixing broken ticket machines and other inconveniences." Overall, Lappin gave the bus service a B, which was slightly better than last year's B-. The Select Bus has gained in popularity: 81 percent of the roughly 1,300 constituents, who responded to a survey Lappin's office conducted last month, said they use these buses, and 75 percent said they want it expanded to other locations. Twenty percent of respondents rated the ease of paying for bus fare as "poor" or "very poor." "For the customers who use the M15 daily, SBS has brought a close to 20 percent reduction in travel time," an MTA spokeswoman said, adding that the off-board fare collection "with proper enforcement" has helped speed the service. "The number of summonses for fare evasion have steadily declined since June 2011 as customers become more familiar with the fare payment system," he said. "In the occurrence that a fare machine is not working, we continue to urge customers to utilize M15 Local service as an alternative."